When you arrive for your afternoon shift, you receive report from the day-shift nurse. He states he just admitted Marc Stevens, age 78, after a colostomy takedown. He reports that the patient’s blood pressure (BP) decreased in the operating room several times, with systolic BP dropping to 70 mm Hg, but he recovered with a fluid bolus. Mr. Stevens weighs 91 kg (200 lb). His BP has been on the low side, currently measuring 90/42 mm Hg, and his mean arterial pressure (MAP) is 58 mm Hg. When you assess Mr. Stevens at 4 P.M., you find his urine output is 40 mL. When you return at 7 P.M. to check his vital signs and urine output, his BP is still a bit low (92/45 mm Hg), but otherwise he seems to be doing well; his urine output this hour is 82 mL. On your final check at 10 P.M., his output is 95 mL. When you return the next day, you learn that during the night and day shifts, Mr. Stevens’ urine output declined to the point where he’s now oliguric and has developed acute kidney injury (AKI). A nephrologist has been consulted to review his case. If the patient’s kidneys don’t improve in the next 24 hours, he will need to undergo dialysis. This situation isn’t unusual. About 5% to 7% of hospitalized and critically ill patients develop AKI as a complication. In fact, in the near future, hospitals may be held accountable if patients develop AKI during their stay. In the general patient population, AKI can stem from various causes. This article increases your knowledge of the causes, types, and phases of AKI and describes how to detect and help prevent AKI. Despite treatment advances, AKI mortality remains high—about 40% in critically ill patients. Factors that may influence high mortality include the increasing age of the patient population and development of multisystem failure. Patients who fail to recover from AKI have a 25% chance of dying within 1 year. Also, in postoperative patients like Mr. Stevens and in AKI patients who need renal replacement therapy (dialysis), AKI is linked to an increased risk of death. Factors that predispose a person to AKI include advanced age, especially in individuals with such comorbidities as diabetes, hypertension, and cardiac disease. With age comes a progressive decline in renal function. Among Americans older than age 70, renal dysfunction prevalence is 15%. Nephrotoxic drugs, such as aminoglycosides and contrast agents, can cause AKI. To avoid kidney injury, these agents must be administered carefully, with dosages tailored to the patient’s condition. Overwhelming infection or sepsis is one of the most common causes of AKI. In normal healthy persons, the kidney receives about 20% of total cardiac output. In contrast, patients with serious infections have reduced BP, which in turn decreases blood flow to the kidneys and leads to ischemia. Renal tubules are highly sensitive to reduced blood flow. Sepsis disrupts blood flow not just to the kidneys but also to the gut and liver; some organs have both well-perfused and nonperfused areas. As blood flow slows and stagnates, some kidney areas become underperfused, ultimately suffering cell ischemia and death. To provide adequate renal perfusion, MAP must be at least 65 mm Hg. When BP or blood flow to the kidneys decreases and MAP falls below 65 mm Hg, both urine output and the glomerular filtration rate (GFR) decline. seizures or coma in severe cases. AKI occurs in three types—prerenal, intrinsic, and postrenal. 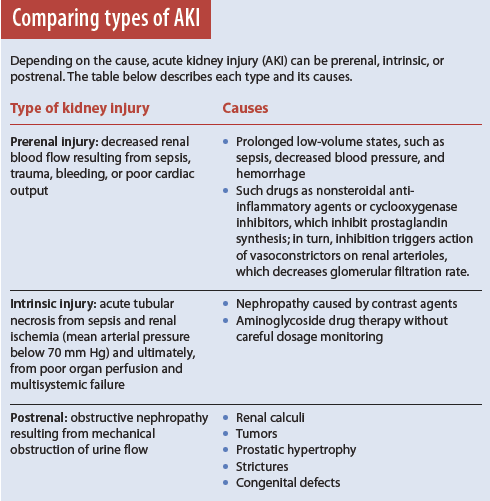 (See Comparing types of AKI). 1. Onset phase: Kidney injury occurs. 2. Oliguric (anuric) phase: Urine output decreases from renal tubule damage. 3. Diuretic phase: The kidneys try to heal and urine output increases, but tubule scarring and damage occur. 4. Recovery phase: Tubular edema resolves and renal function improves. (See Four phases of AKI). For decades, the standard tests for assessing renal function have been blood urea nitrogen (BUN), serum creatinine, GFR, and urine output measurement. But recent research shows BUN and creatinine tests are inadequate and don’t reflect real-time kidney function. Although BUN has long been considered a marker of kidney injury, it can be affected by many factors, including drug therapy, nutritional status, GI bleeding, trauma, and infection. Also, it may rise simply from increased protein intake. And because BUN takes up to 24 hours to rise, it doesn’t indicate when kidney injury occurred; so increased BUN is a late indicator of injury. Serum creatinine monitoring is inadequate because the creatinine level is affected by the patient’s muscle mass, age, race, and gender. Also, it may not rise for 12 to 24 hours after kidney injury. Neither BUN nor serum creatinine levels accurately reflect the GFR or degree of tubular injury. Neutrophil gelatinase-associated lipocalin (NGAL). The NGAL level in renal tissue rises dramatically after the kidney experiences poor perfusion or ischemia. Measurable in both the serum or urine, it increases 24 to 48 hours before serum creatinine rises. Cystatin C. Freely filtered and reabsorbed in the proximal tubule, cystatin C is detected in both the urine and serum. Elevated serum levels have been found to be early AKI predictors. Cystatin C also independently predicts increased mortality. Tissue inhibitor metalloproteinase-2 (TIMP-2). This biomarker appears in the urine within 12 hours after renal tubular cells are injured from ischemia or sepsis. In one study, urinary TIMP-2 testing showed certain patients had seven times the risk of developing AKI. GFR. This biomarker is reflected directly in urine output. Normal GFR depends on cardiac output. Decreased cardiac output stemming from reduced blood volume or BP affects GFR immediately, giving bedside clinicians more timely information on kidney perfusion. Also, GFR is simple to monitor if the patient has an indwelling urinary catheter. It’s one of the best real-time indicators of current kidney function. Recent research on AKI focuses on the importance of fluid and electrolyte management. Studies show fluid overload increases morbidity and mortality. In AKI, the kidneys produce much less urine, increasing the possibility of fluid overload. Therefore, urine output monitoring, in conjunction with creatinine measurement, is being studied much more closely than in the past. In one study designed to determine the value of monitoring urine output in detecting AKI, researchers carefully measured output in critically ill patients; they found AKI incidence rose from 24% to 52% when urine output was added as a variable and monitored hourly. This study indicates urine output directly reflects GFR in the kidney and therefore is a sensitive and early AKI biomarker. In research that examined the duration of low urine output and its consequences, researchers found even brief episodes of oliguria (an hourly urine output of 0.5 mL/kg or less) had significant implications, compared to daily creatinine measurement alone. Mortality increased significantly in intensive-care patients with more severe oliguria. In another study, patients with oliguria and no change in serum creatinine levels had a significantly higher mortality; the authors noted AKI was diagnosed earlier in oliguric patients even when urine output was measured every 3 hours. In the past, urine output wasn’t considered an important or valid biomarker of kidney function. Clinicians paid more attention to the ABCs of resuscitation. Of course, airway, breathing, and circulation are critical, but if other major organs, such as the kidneys, aren’t adequately perfused during surgery and consequently suffer damage, the entire body suffers. Nurses need to understand the importance of adequate urine output in preventing AKI consequences, such as the need for life-long dialysis. We need to pay closer attention to urine output because it’s easy to measure and predicts AKI. Although we’ve been taught how to measure urine output, we may not have been taught how often to measure it or why frequent and accurate measurement is important (especially in postoperative and elderly patients). Typically, we focus our monitoring efforts on BP, heart rate, and respirations, paying minimal attention to low or borderline-low urine output, even when it persists. In many cases, when we report low urine output, we’re told simply to “keep an eye” on it. For these and other reasons, urine output measurement may not be timely or accurate. As discussed earlier, urine volume directly reflects GFR. Urine output should measure at least 0.5 mL/kg/hour. For a postoperative patient like Mr. Stevens, measuring output hourly for the first 4 to 6 hours after admission to the unit is crucial in assessing postoperative kidney function. With catheterized patients, some nurses still measure urine output only when they’re able to or based on their understanding of what’s best. During the postoperative period, urine output measurement hinges on many variables—the nurse’s knowledge of the importance of hourly urine output, how busy the nurse is, how convenient it is to measure how much urine has drained into the bag, whether a urimeter is used, amount of urine that remains in the tubing, and patient positioning. Also, most nurses have large workloads and may not have time to measure urine output hourly, especially in postoperative patients. In addition, hourly urine output measurement might be conveyed to the bedside nurse by a nurse’s aide or nurse technician, who may not know how much urine to expect to see in the urinary catheter and thus may not inform the bedside nurse of decreased output in a timely manner. The physician’s understanding of AKI and urine output also plays a role; some physicians consider urine output less significant than other assessment findings. Yet in many cases, measuring urine output regularly can promote timely detection and intervention for AKI. Left undetected, AKI can progress to ESRD, which has extensive effects and decreases quality of life. We need to increase our knowledge of the causes and complications of AKI—and educate new nurses on the importance of frequent postoperative urine output measurement as a way to prevent this serious condition. Current methods of detecting AKI, such as BUN and creatinine measurement, are inadequate and don’t allow early diagnosis. New biomarkers to measure AKI are on the horizon but haven’t been implemented throughout the United States. Nonetheless, bedside nurses can improve outcomes by recognizing which patients are most vulnerable to AKI, monitoring urine output closely, and advocating for improved education about AKI and better communication with physicians. Greater focus on AKI prevention must come not just from bedside nurses but from all healthcare professionals. De Backer D, Donadello K, Taccone FS, Ospina-Tascon G, Salgado D, Vincent JL. Microcirculatory alterations: potential mechanisms and implications for therapy. Ann Intensive Care. 2011;1(1):27. Engoren M, Habib RH, Arslanian-Engoren C, Kheterpal S, Schwann TA. The effect of acute kidney injury and discharge creatinine level on mortality following cardiac surgery. Crit Care Med. 2014;42(9):2069–74. Hall G, Esser E. Challenges of care of the patient with acute kidney injury. J Infus Nurs. 2008;31(3):150-6. Kidney Disease: Improving Global Outcomes (KDIGO). Acute Kidney Injury Work Group. 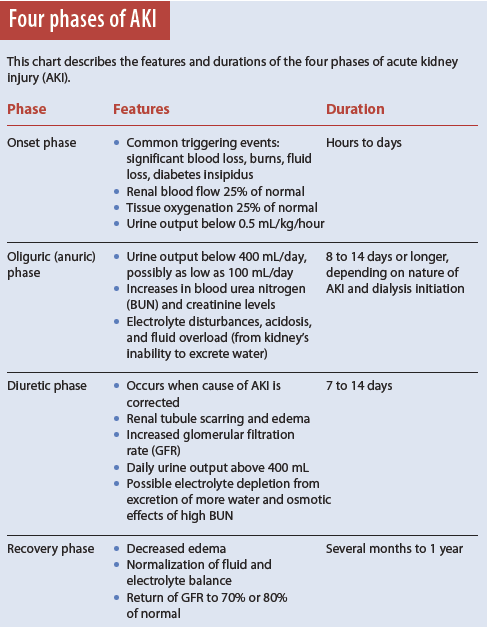 KDIGO Clinical Practice Guideline for Acute Kidney Injury. Kidney Inter Suppl. 2012; 2:1-138. Macedo E, Malhotra R, Bouchard J, Wynn SK, Mehta RL. Oliguria is an early predictor of higher mortality in critically ill patients. Kidney Int. 2011; 80(7):760-7. Macedo E, Mehta RL. Measuring renal function in critically ill patients: tools and strategies for assessing glomerular filtration rate. Curr Opin Crit Care. 2013;19(6);560-6. Mandelbaum T, Scott DJ, Lee J, et al. Outcome of critically ill patients with acute kidney injury using the Acute Kidney Injury Network criteria. Crit Care Med. 2011;39(12): 2659-64. Moore EM, Bellomo R, Nichol AD. The meaning of acute kidney injury and its relevance to intensive care and anaesthesia. Anaesth Intensive Care. 2012;40(6):929-48. Murugan R, Kellum JA. Acute kidney injury: what’s the prognosis? Nat Rev Nephrol. 2011;7(4):209-17. Poukkanen M, Wilkman E, Vaara ST, et al. ; FINNAKI Study Group. Hemodynamic variables and progression of acute kidney injury in critically ill patients with severe sepsis: data from the prospective observational FINNAKI study. Crit Care. 2013;17(6):R295. Singbartl K, Kellum JA. AKI in the ICU: definition, epidemiology, risk stratification, and outcomes. Kidney Int. 2012;81(9):819-25. Wagner KD, Hardin-Pierce MG. High-Acuity Nursing. 6th ed. Upper Saddle River, NJ: Pearson Education, Inc.; 2013. Zhang Z, Xu X, Ni H, Deng H. Urine output on ICU entry is associated with hospital mortality in unselected critically ill patients. J Nephrol. 2014;27(1): 65-71.